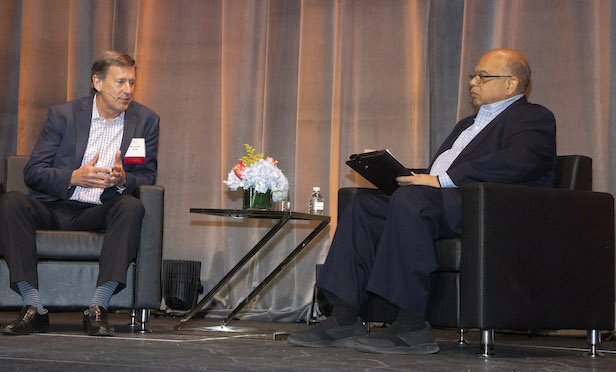 At the REBNY spring luncheon, Google’s director of real estate NYC stressed his company’s commitment to the community as integral to how it does business. NEW YORK CITY—Paul Darrah, director of real estate NYC at Google, formerly was an architect before Michael Bloomberg tapped him to head real estate for Bloomberg LP. So, he has been around the block in navigating the city’s real estate terrain. Speaking with the Real Estate Board of New York’s president John H. Banks, at the association’s members spring luncheon, Darrah emphasized that any companies coming into New York should ask how they impact the community where they are residing.